Congratulations, Peg! You've won a $25 gift certificate to The Funkie Junkie Boutique! Please email me at kim@eclecticpaperie.com to claim your prize. 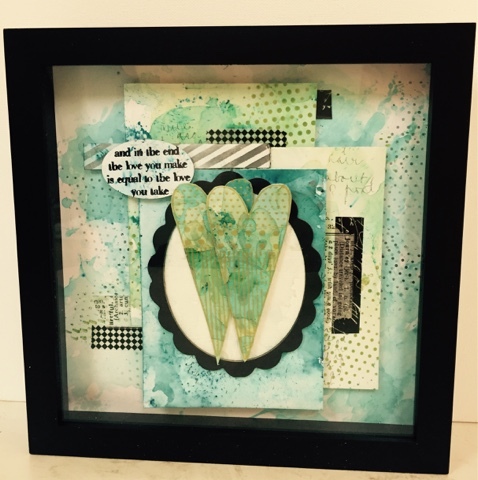 Be sure to check out Peg's beautiful Wendy-inspired creations...not only did she make this beautiful framed art piece, but she also created a number of cards all sporting lovely polka dots! Way to go Peg! It's an awesome piece of Art! Thanks Wanda, Kathy and everyone. I can't wait to see what the August challenge will be. Now that I have packed the house, moved and unpacked the house I am ready to play again!! !